The last few weeks has seen increased speculation that Amazon will be joining the battle for the living room and this afternoon our suspicions were confirmed when Amazon announced that the Amazon Fire TV streaming box is officially a reality. Quite simply described as a tiny box that plugs into your HDTV for easy and instant access to Netflix, Prime Instant Video and also offers the chance to play games which can be played with a separately sold controller, which looks remarkably similar to something Microsoft might produce. Interestingly Peter Larsen came straight out swinging haymakers, by describing games consoles as too expensive and Apple TV’s mirroring efforts as laughable and even continued with an uppercut to their competition by criticising the lag on Apple TV, Microsoft’s Xbox Live and the Roku box. A quick look under the hood reveals that Fire TV sports a quad-core processor with a dedicated GPU, 2GB of RAM (2X to 4X more than competing devices) and state-of-the-art MIMO Wi-Fi for “screaming” wireless performance. In Layman’s terms despite being much thinner it offers three times the performance of Apple TV with the additional gimmick of being able to search for content with your voice, which should make their competitors stand up and take notice. 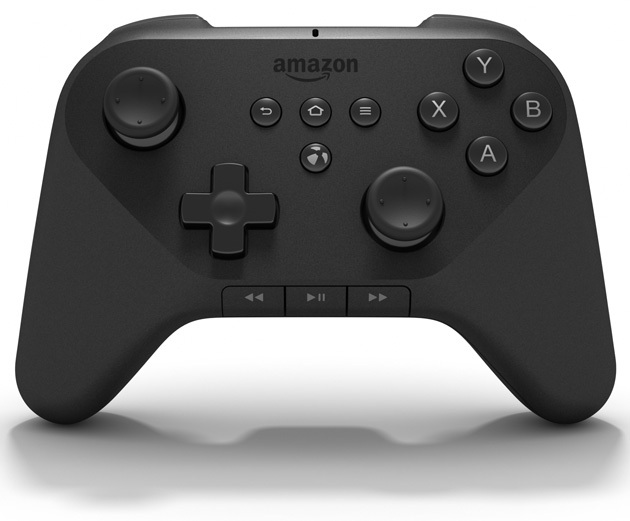 “With Fire TV we thought of games right from the beginning – fun immersive games at affordable prices.” Amazon proudly announces.